It goes without saying that I have been derelict in my blogging duties. I've got lots going on in, and in relation to, the studio. I also have a backlog of material, so will do my best to bring things up to date. First, I spent June gearing up for work on Spartan Holiday No. 2, The Five Pagodas. No. 2 is a continuation of the Shanghai story that started in the first issue. More on that to come. As for getting underway, my spring teaching responsibilities crowded out the headspace necessary to begin, so I just delayed getting started. (I can execute to a plan when I am busy with academic [as opposed to studio] courses, but I can't think capaciously in the way I must in order to launch something big.) June involved sneaking up on the project. I've had the text written for months, so that hasn't been the problem; rather, I was preparing to create and then fill out a content dummy for the mag. How to begin? For me, Step 1 involves camping out with sources that inspire me, especially formally. I have written before about the nourishment one gets from favored sources. I work through a pile of books and materials in search of images I want to live with for the duration of the project. After sifting these, I compose them in an arrangement: The Wall. Many of the same people appear as have shown up at other times, but there are new ones, too. In the shot above, an uncredited drawing of an astronaut from a package design; a Stuart Davis diptych, Deuce, 1951-54; W. W. Denslow's Tin Man from in the 1900 edition of The Wizard of Oz; a Maxfield Parrish illustration from The Golden Age, also from 1900; two frames from a Floyd Gottfredson Mickey Mouse strip done under contract for Disney that appeared on November 20, 1933, from a detective plot line; a Japanese war print from 1895; a Lucienne Day textile design (one of several on the wall); a Chinese propaganda pamphlet from the Cultural Revolution era. Back to the astronaut: somewhere years ago I got this crazy Codemaster telegraph set, released in the late 40s or early 50s, packaged anew for the space age circa 1960. 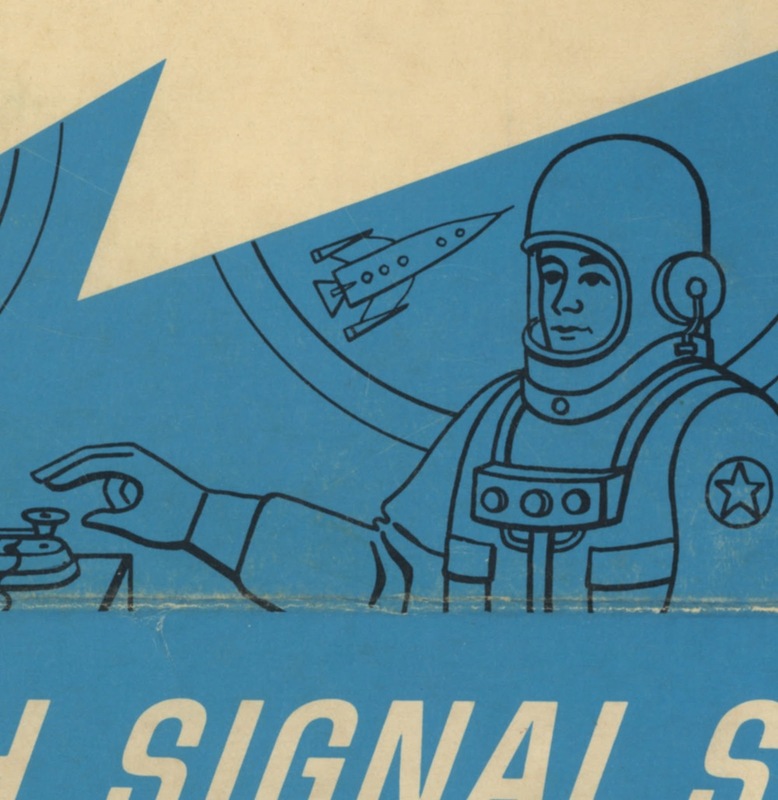 First of all, I love the idea that interplanetary travelers will be communicate via telegraph. But my visual excitement has to do with the juxtaposition of the linework in the astronaut and the abstract linear passages in the Davis. Under other circumstances, I might go off on an extended formalist-nerd riff about this, but not today. Just enjoying it for now, and recognizing, hardly for the first time, that the form-making enterprise of visual modernism drew on the resources of commercial imagemaking to a great degree, and vice versa. Below, courtesy of eBay, an earlier version of the Codemaster set offered by Brumberger. I've mislaid my camera; these blurry iPhone pics will have to do for now. Soon my wall will break down, as sketches get pinned up to track progress. But I sure have enjoyed sitting in front of it for several weeks now. In a few months, I'll look back on the work I've made recently and see connections that aren't there yet. Fun is at hand.